English National Concession: free off peak travel (between 9.30am and 11.00pm Monday to Friday, all day Saturday, Sunday and bank holidays) on local bus services throughout England. 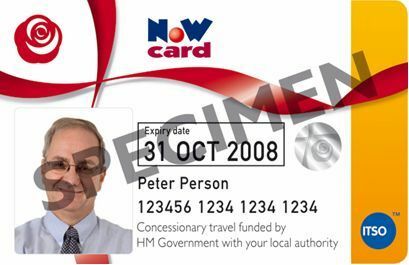 English National Concessionary travel NoWcard passes issued by Blackpool Council can travel free of charge on Blackpool Trams between 0930 and 2300 Mondays to Fridays and all day on Saturdays, Sundays and Bank Holidays. 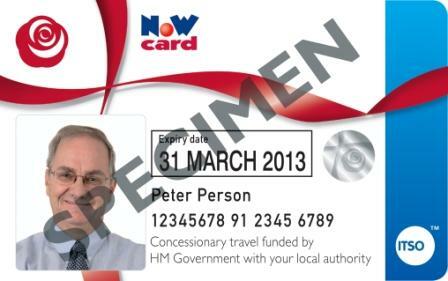 From 1 April 2016 holders of English National Concessionary travel NoWcard passes issued by Lancashire County Council to residents of Wyre Council can travel free of charge on Blackpool to Fleetwood tramway between 0930 and 2300 Monday to Friday and all day on Saturdays, Sundays and Bank Holidays. Lancashire County Council issued passes, held by Wyre Council residents, are not valid on trams after 1800 (6pm) on Friday, Saturday and Sunday evenings during the illuminations period and every night during the October half term school holiday period. Passes are not valid on Illuminations Tours or Heritage Excursions at any time. Passes are also not valid for journeys starting in North Yorkshire or Lancashire on the following summer-only services. On these services passholders pay standard adult fares to a maximum of £4 single and £6 return. They can also buy a Dales Privilege Rover for £6.00 for a day's travel throughout the DalesBus network on Sundays and Bank Holidays. From 3rd December 2018 - £1 flat fare per journey on local bus services which start, end or are wholly within Lancashire (includes Blackburn with Darwen and Blackpool) before 09:30 Monday to Friday. From 3rd December 2018 holders of English National Concessionary travel NoWcard passes issued by Blackpool Council will receive a 50p flat fare per journey on local bus and trams services which start or are wholly within Blackpool before 09:30 Monday to Friday.